In July 1914 a large party was held to celebrate the coming of age of Rowland George Winn. The whole estate was invited, as well as miners, villagers and local dignitaries. A few days later, Britain entered the First World War, and looking back, this party is now seen as the last ever great country house party, at the end of an era. I worked with the team at Nostell Priory to create a celebration of these final days of peace. I sourced and managed suppliers, and liaised with designers to create the invitation, signage and programme. Working to a tight timetable, I created event planning documents to support communication and keep the busy team on track as the party developed. There were many different elements to the party, so that visitors of all ages, with a range of motivations for visiting, could find something they wanted to do. There were various ways for visitors to dip in to the heritage of the property and the surrounding area. Using an eyewitness report of the event, printed in the Wakefield Express, I wrote celebratory speeches. These were delivered to an audience sitting on Edwardian style deckchairs and Farmer Bob’s hay bales, who joined in with cheers and laughter taking their cues from applause boards. 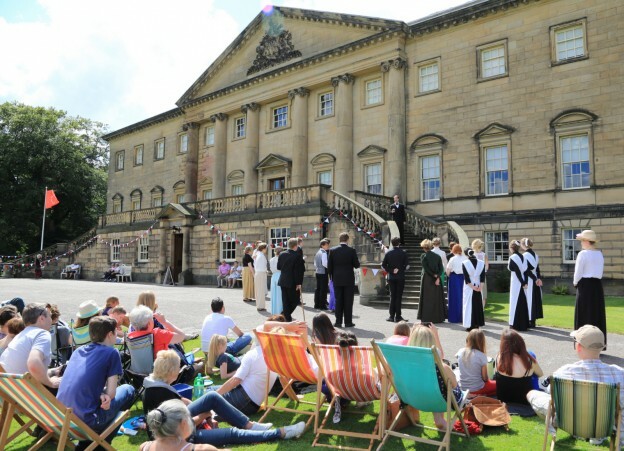 The Yew Tree Youth Theatre told the Winn family story on the steps of the mansion. I commissioned a short programme of period archive films from Screen Yorkshire. Nurses taught bandaging skills in an old bell tent, and families could create postcards to send home. Interpretation flags around the site told the tales of Nostell’s lords and ladies, miners and maids. Many, many metres of bunting, a brass band and tunes from vintage gramophones gave a village fete atmosphere. The magnificent Vintage 78 DJs provided authentic vintage games including croquet and bagatelle, and we held a traditional sports day. They have written all about it, and shared some great photos, on their blog. In Professor Tubby’s Photographic Parlour, guests dressed posed for portraits in Edwardian clothes. Artist Tim Rose captured the scene in watercolours from beneath an empire sunshade, encouraging others to pick up a pencil and have a go. Energy levels were kept topped up by tea and cake from the Women’s Institute, and Barnsley bitter from local brewery Stancill. A lovely day. We enjoyed all the games and activities at the same time as learning about WW1 history. 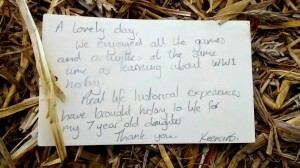 Real life historical experiences have brought history to life for my 7 year old daughter. Thank you. The event was part of the Red Poppies and White Butterflies project, uncovering the world of Nostell’s people, funded by the Heritage Lottery Fund. The project was part of Duty Calls: The Country House in Time of War, a co-operative series of exhibitions and events over 2 years, involving 9 country houses in partnership with the University of York. The series was awarded best WW1 Event 2014 by Hudson’s Heritage.